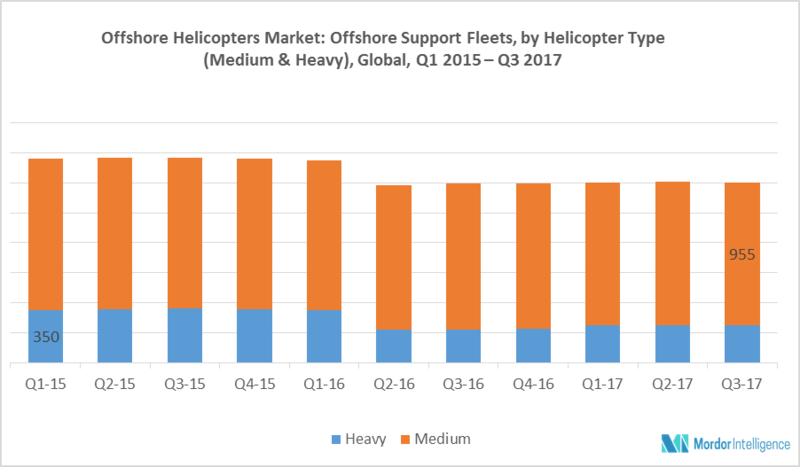 In 2018, for the first time, the offshore helicopter market registered growth, owing to increase in offshore drilling and production activity. Owing to the higher oil prices and lower breakeven prices, major operators, like Equinor SA, Shell PLC, and Exxon Mobil amongst others, have announced plans to invest in a number of deepwater projects. Owing to this development, the offshore oil and gas industry spending improved significantly, particularly during the second half of 2018. As a result, the offshore drilling and production activity had also picked up pace during the second half of 2018. However, due to the declining demand for offshore helicopter services during 2014-2017, the market witnessed major changes that have the potential to make structural changes in the industry. For instance, CHC, the leading market players, filed for bankruptcy, in 2016. HNZ, another major market player, sold its large part of offshore helicopter business to PHI Inc. at the end of 2017. Though, the helicopter industry is expected to grow during the forecast period, the growth rate is expected to remain moderate and the market is not expected to reach 2014 levels. The helicopter utilization rates for all types (small, medium and heavy) are expected to remain moderate. As a result, profitability is also expected to remain low, leading to more mergers, acquisitions, and joint ventures during the forecast period (2019-2024). Crew transfer services in the offshore energy industry have witnessed a shift from the costly helicopter to crew transfer vessels, to reduce their operation cost during the period of downturn. The trend was supported by low day rates of the crew transfer vessel post-2014. Large crew transfer vessels (LCTV) are designed for 100 seats and more. The purchase price of an LCTV is about the same as a helicopter. However, LCTV costs about USD 3,000 per hour to operate, as compared to USD 10,000 per hour for a helicopter. Though the cost for a round trip of 500 nautical miles is slightly less for the helicopter, as it carries fewer people, the cost per seat of an LCTV is estimated to be 50% cheaper. Additionally, it can also carry cargo. This has negatively impacted the demand for offshore helicopters services. The offshore oil & gas industry is moving towards deeper waters, owing to declining shallow water reserves. The situation has resulted in growing distance from shore to the offshore platform. Therefore, the requirement for medium and heavy helicopters is expected to increase while the demand for light helicopters is expected to remain steady. The demand for helicopters are expected to grow rapidly in the wind industry as countries in the Asian region, particularly, China, Taiwan, and India are investing heavily in building offshore wind farms. However, given the small size, the offshore helicopter services market for the wind industry, the high growth in demand from the wind power sector is not expected to affect the overall offshore helicopter services market significantly. Europe is estimated to be the largest market among the regions for the market studied. This is mainly due to the large number of offshore oil and gas platforms, severe sea conditions, and strict safety regulations promoting helicopter services for transportation services. Moreover, the wind farms out in the North Sea and other shallow European waters are expected to witness significant capacity additions during the forecast period, largely supported by government auctions, as well as due to the cost of investing in offshore wind, which is no more than the conventional power generation. On the other hand, Brazil is expected to be among the fastest growing markets, mainly due to a large number of upcoming offshore oil and gas projects in the pre-salt basin. December 2018: CHC Group announced that it has been granted the contract from OMV (Norge) AS, to provide helicopter facilities in support of its upcoming drilling program at the PL 644 field in the Norwegian Sea. October 2018: Yamato Holdings Co. Ltd and Bell Helicopter, announced their strategic collaboration for the future of civilian aerial logistics. They together plan to increase their market share in electric vertical take-off and landing (eVTOL) logistics by collaborating in integrate innovative autonomous unmanned vehicle systems and package handling systems. Major Players: Bristow Group Inc, CHC Group Ltd, Era Group Inc, PHI, Inc., Abu Dhabi Aviation (ADA), Airbus Group SE, Leonardo SpA, Textron Inc., Lockheed Martin Corporation, amongst others.